Here's an update on the San Mateo County real estate market for the first quarter of 2014. This single family home comparison is organized by school district with API score, including the median price, average $/sf, average days on market, and changes from the first quarter in 2013 and 2007. Hope this provides some helpful insight as a buyer or seller. An analysis of the charts below reveals that Mountain View, though it is more volatile than some of the more expensive markets in the area, is consistently considered a seller’s market. Mountain View is quickly absorbing all of its homes for sale and currently has one of the lowest month’s supply of inventory (MSI) in the Bay Area at .5 months. Only time will tell how long this astoundingly low inventory supply will affect the other key statistics though it can only be assumed that days on market (DOM) will decrease while sales absorption (SA) rates and median prices will increase given historical data. The chart shown above graphs Mountain View’s MSI as well as the DOM. Traditionally, DOM is cyclical in nature decreasing in the spring and summer, and increasing in the fall and winter, and the Mountain View market is no exception. For the most part, the level of inventory has been decreasing since May 2010. It is currently sitting at an astonishing low inventory level of .5 months. 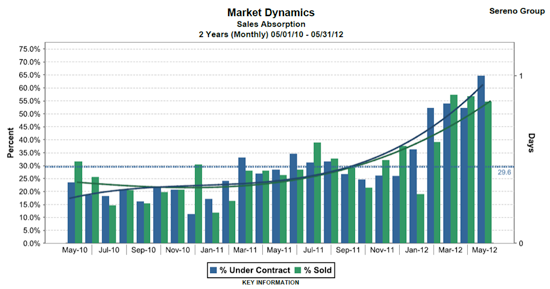 As you can see by the chart above, the sales absorption rate in Mountain View has been steadily increasing from May 2010 through May 2012. 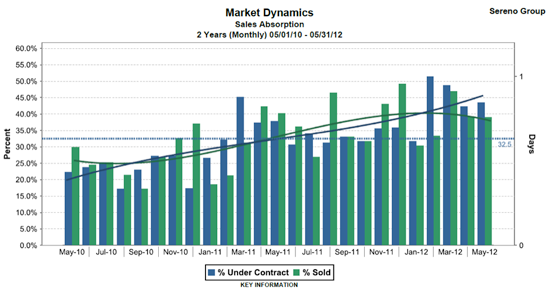 In May 2012, the current sales absorption rate was 64.6% of properties under contract and 54.6% of properties sold. Over the course of the last two years, Mountain View had a swing in median price of about $200,000 as shown in the above chart. The solid line showing average median price has been relatively stable with a slight dip in late 2011. Since February 2012, Mountain View has seen a stable median price just over $750,000.